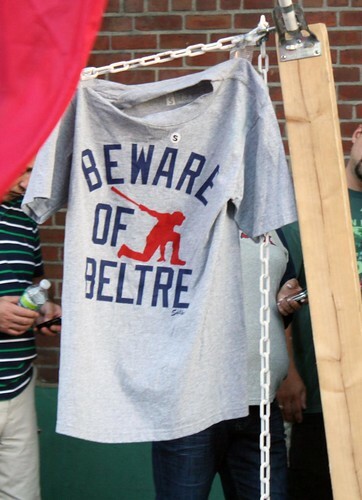 Beware of Beltre - Cursed To First - Sox and Pats forever. Adrian Beltre smacked a solo shot into the upper deck in the left field corner in the top of the fourth inning, dropping onto one knee so hard (as on the T-shirt above) his other foot came off the ground, and his arm flailed open, so that it almost looked like he was accompanying his big finish with jazz hands. We’ve come to look for a show bigger than the homer itself whenever Beltre returns to the dugout after going deep. This time, even though the act has been going on for weeks and weeks now, they topped even our heightened expectations. Beltre was prepared. He held his batting helmet firmly on his head with one hand as he passed through the crowd of his teammates, high-fiving with his other hand. Finally he broke through near the Gatorade coolers, as most of his teammates stood back and laughed. But not V-Mart. No, he stared after Beltre with laser-like focus, clearly plotting. “They’ll get to him,” was Remy’s call. Eventually it was Bill Hall who approached Beltre, reaching for the batting helmet. At first Beltre ducked away, but ever so calmly, speaking to him in hushed tones like the Horse Whisperer, Bill Hall got Beltre to let him lift the helmet from his noggin. See? Hall seemed to be saying, as he retreated from Beltre, shrugging. That’s all I wanted. He faked going for Beltre’s head then, but stopped at the last second. The two parted with a smile. “Right now, I think they’re just lullin’im to sleep,” said Remy. When next the camera cut to the dugout, Beltre was helping himself to a drink at the cooler and then V-Mart rose up behind him, grinning diabolically and dragging both palms languidly from Beltre's forehead to his crown before the third baseman could wriggle away. To which Beltre responded by turning on Victor and throwing the remaining ice and liquid in the Gatorade cup he was holding into Martinez’s face. Which is when Marco Scutaro rushed at Beltre as if he was going to try and tackle him. Beltre, reacting with catlike reflexes, hucked the crumped-up cup at him so hard his arm windmilled almost 360 degrees. It looked like it actually scratched Scutaro’s arm a little. With wax-coated paper. Another lull. V-Mart, eyes wide, diverted Beltre not unlike Jeff Goldblum with the torch and the T-Rex in Jurassic Park. Beltre looked just about to lunge for V-Mart when Scutaro, having quietly grabbed a handful of ice from another cooler, planted it on Beltre’s cranium. For the next few moments, there was little audible but the wheeze of Remy’s laughter. The three of them tussled again briefly, then separated, grabbing towels and continuing to talk trash. Beltre’s face was contorting itself when he turned toward the camera again, struggling not to crack a smile. When he took the field for the next inning, he was using his jersey to cover his giggles. Needless to say, this has yet to get old for me, either. Tonight was a nice, tidy, comfortable game for the Sox, from the more reasonable hour of the first pitch (6:30 pm ET) to the lead they took in the top of the sixth on a Chone Figgins error at second and never lost. Ryan Kalish wielded a hot bat, dropping nasty liners just fair down the right field line. Buchholz put up a good line, but there was a fine line between his seven innings of one-run ball and a much more crooked line, as the Sox defense got him out of several jams early on and he managed to overcome a two-walk episode of wildness in the sixth. It looked sometimes like his curveball just wouldn’t bend. Another encouraging sign: Okajima pitched a clean inning, and as was pointed out on Twitter, 6 1/3 scoreless since coming off the DL in August. Beating up on a bad team like the Mariners is also encouraging, but Boston remains 6.5 games out, even after the Yankees have lost 8 of their last 10 games and the Red Sox have won 6 in their last 10. I guess I’m just past a certain turning point already this year. At this juncture, the Red Sox are going to have to do something proactively to inspire my hope, instead of something disappointing to shatter my confidence, in order to change how I feel. I’m not completely ruling it out. But there hasn’t been another turning point for me yet. Thanks for the summary. I was stuck at the office and missed all the fun. Your description of the Beltre thing makes me sorry I missed the game.